First, a tip of the hat to theuneditedfoodie for his recommendation of Chris Glen's breads. Thank you, Raj! Because of Raj's comment on a recent blog of mine about Fervere Bakery, my wife and I made a jaunt down to The Bad Seed market in the 1900 block of McGee Street in Kansas City. It's a funky little (with emphasis on funky and little) marketplace that features different providers of everything from hand-crafted soaps to free-range chicken (and eggs) to breads to produce. Plus a few other things that I probably missed. It is open on Friday evenings from 4:00-8:00. 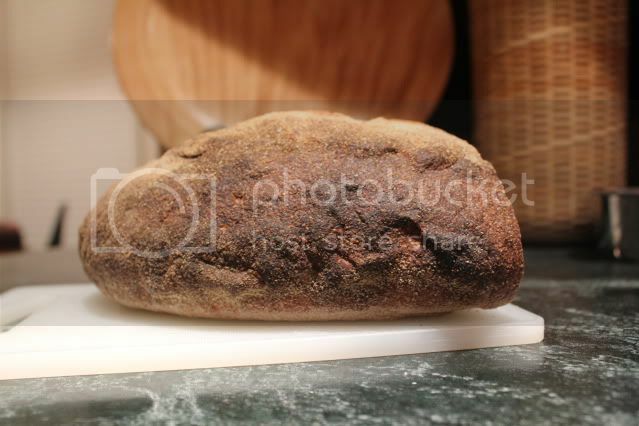 The market has recently added a new vendor of artisanal breads, The New Traditionalist. You may have noticed that The New Traditionalist, aka Chris Glen, was quite outspoken in his praise of Fevere's products. On the one hand, that's a very gracious acknowledgement of a competitor. On the other hand, Chris knows whereof he speaks because his own breads are equally praiseworthy. I purchased a loaf of his whole wheat bread. 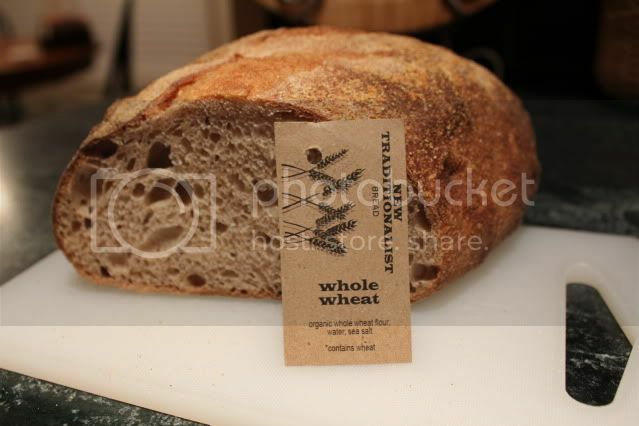 It is a naturally leavened bread consisting of organic whole wheat, water, and sea salt. You can't get much more elemental than that. which enhances the play of flavors between crust and crumb. 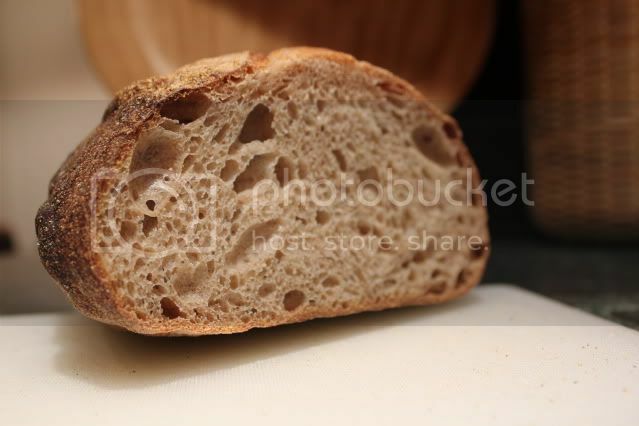 The crumb texture is very light and open. No bricks here. You can see that the crumb is open, laced with bubbles of all different sizes. The sheen of the cell walls attests to full gelatinzation of the starch. Chris shares a commercial kitchen with another business, baking his breads in pizza ovens. That isn't an ideal setup but Chris has found a way to go beyond his circumstances instead of being limited by them. As I write this, I realize that I ought to have asked Chris what flour he uses. It appears to be very finely ground since large flecks of bran aren't evident in the crumb. Now, you may have wondered why I mentioned a chocolatier in the title for this blog. That has to do with a bit of geographic serendipity. Christopher Elbow Chocolates has a store exactly one block north of The Bad Seed. In appearance, it is everything that The Bad Seed is not. Glamorous. Gleaming. Elegant. Refined. Although Elbow refers to his products as artisanal, one would not be far off the mark by referring to them as art. We, naturally, did not leave empty-handed. Once my wife spotted the toffee robed in dark chocolate and covered with toasted pecans, the deal was sealed. There is a greater serendipity at work here than just geographic location. The one that I was surprised by this evening has to do with flavor, with maximizing the potential of the ingredients. I had savored two or three slices of Chris' whole wheat bread with a bowl of soup at dinner, marveling at the richness of the flavors he had teased from such simple ingredients. And then the stunner: I tasted many of those same flavors in a piece of Christopher's toffee when I had it for dessert. Yes, there were differences. The candy, for instance, tasted nothing of wheat or levain and the bread wasn't nearly so sweet as the candy. But both the candy and the bread shared flavor notes of nuts, of toast, of chocolate, of deeply roasted malt, of butter. I am frustrated by my inadequacy in providing an accurate description of what I sensed, because there was so much more than I can put down here in words. The parallels were so clear, so surprising, and I would have missed them entirely if I had not eaten the two in close succession. Beyond the specific flavors, the bread and the toffee each displayed a respect by their makers for the ingredients, as well as a willingness to apply skill and technique to realize every potential locked in those ingredients. Thank you, Chris, for a superb loaf of bread. May The New Traditionalist prosper. I met him at the Bad Seed a few weeks ago. That is seriously good bread. Chris is also a one of a kind type of guy. Chris is very dedicated to making and appreciating good bread. Whenever we have another KC TFL meetup, we need to be sure to invite him. He had read about the previous one but was not able to attend on that date. Inspiring post, Paul! It is great to know that many still prefer the traditionalist approach. It is sustainable. for its low margins, so time will tell if The New Traditionalist has a sustainable business, Khalid. One of the problems for a baker of Chris' caliber is that people who would be his best customers, like you or I, typically won't buy his bread because we're so happy to make our own at home. Will have to visit The Bad Seed, next time I am in KC... is it on the MO side or the KS side? Only open Friday evenings, right? You can google their web site for location, dates and times. They are about to go on hiatus and reopen some time in May, I believe. Chris will also be selling his breads at the Overland Park Farmers Market in Overland Park, KS, when it opens this Spring. I believe that most people's palates are so used to overly flavored and salted foods that they can no longer taste the most flavorful parts of their food! They are missing 75% of the joy of taste and I believe this is one of the reasons why people eat MORE. They are looking for a satisfying experience and not tasting it when it is right in front of them! People need to take a moment to actually taste and appreciate the flavors instead of bolting their food down without giving their taste buds more than just a brief expposure. You are NOT one of those people! You have the joy of actually tasting ALL the savory goodness that simple food offers when it is skillfully and properly made. Congratulations! That appreciation and ability is not an attribute that everyone has. Your description makes me wish I had a reason to visit Kansas! Mostly, what I have is some experience, rather than any exceptional capability for sensing flavors and fragrances. Experience has taught me that things which are new to me may be delightful or may be disgusting but I'll never know until I try them. Consequently, there are things that I eat with gusto now but would not have touched when I was a kid. (Seriously, green fig preserves?! But, boy, are they good!) Experience has also taught me that one serving well-enjoyed is better than two servings poked down as fast as possible. And, frankly, I'm a lot pickier about what I eat nowadays, at least in the sense that I want my food to taste good. By the way, you are welcome to visit Kansas anytime you please, even if it's just to visit Kansas. The New Traditionalist bread is something that truly inspires an equally good quality of writing- well done Paul. I haven't met Chris in person so far, but am definitely looking forward to seeing him- perhaps this friday at Badseed. But from his work it is totally clear, that here is an incredibly talented individual with a flair for good bread. I also agree with you on the point that you shared with Khalid, that often customers like you and I are content on baking our own breads. Since, you were enthusiastic enough to try the New Traditionalist, I would suggest another bakery/cafe, it is called Le Monde Bakery in North KC, MO- just google search it and you will get the basic info. Between the Fervere and New Traditionalist breads, and working through some that I had in the freezer, the only baking I've done in recent weeks is sourdough English muffins. I need to get back into the kitchen!